→ OEE (Overall Equipment Effectiveness) is an index to judge production run in terms of machine (equipment) availability, Production rate & quality of the product. → For TPM (Total Productive Maintenance) and Lean Manufacturing programs, OEE is key matric. → It is an important characteristic of capacity planning, material planning, and other resource planning. 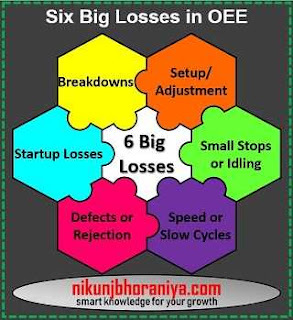 → OEE is also known as TEEP (Total effective equipment performance). 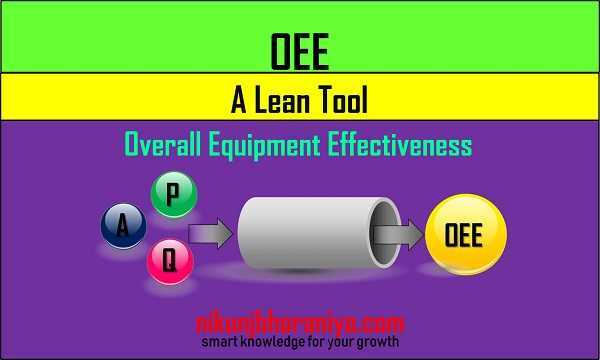 → Overall Equipment Effectiveness is a Lean Manufacturing Tool. → Availability shows the available time of the machine. → In other words, for how much time our machine is available for production. → Availability takes into account of Down Time Losses. → Downtime losses include event or incidents that lead to stoppage of planned production for a considerable time. → After removing, downtime we can get operating time. → Performance shows the excess time taken for the production as compared to standard operating time. → The performance takes into account of Speed Losses. → The Speed Losses includes any factor that leads to operate production with more cycle time than maximum permissible. → Quality shows the good quality of the produced parts. → It takes into account the quality losses (loss due to the production of a bad part). → Quality loss can only be present due to the production of a defective part or non-conforming part. → Planned Shutdown – Not part of OEE (Overall Equipment Effectiveness) Calculation. → Down Time Loss - Operating Time to Planned Production Time ratio is called availability, when a process run without any stoppage there will be 100% availability. → Speed Loss – It is the ratio of net operating time to total operating time or it can be calculated by actual cycle time / ideal cycle time. When process run with maximum theoretical speed then performance will be 100%. → Quality Loss- it is the ratio of total good parts to a total part produced. When all produced parts are good then there will be 100% quality. → The breakdown comes under the Category - Downtime Loss. → Unplanned downtime elimination is critical. → Preventive maintenance is a key weapon to kill unplanned downtimes. → Root cause analysis can be done on severe downtimes. → Timely validation of tool is also important in order to prevent unplanned downtime. → Prediction of equipment failure is a key skill of engineering that helps a lot in the prevention of downtime. → Setup and Adjustment come under the Category - Downtime Loss. → It is generally called time between the last good part produced before setup change and first good part produced after the changeover. → Tracking of adjustment time is very important in reducing this loss. → We can use the concept of SMED (Single Minute Exchange of Dies) for reducing the Setup and Adjustment time. → Small Stops comes under the Category - Speed Loss. → Recording of this type of loss is very difficult. → Cycle time analysis to be used to identify this type of loss. → Activity wise actual time monitoring and micro-mapping of this data help in the identification of small stops and speed reduction. → Recording of Reduced Speed losses is very difficult. → It can be recorded by Cycle time analysis. → Start-up Reject comes under the Category - Quality Loss. → “First Time Right” concept to be adopted during each startup of production. → Effective use of production start-up check sheet can eliminate start-up rejects. → Process parameter setting plays a vital role in the manufacturing of the good part at the first time. → It helps us to set goals for improvement, and track the progress. → OEE helps us to find inefficiencies in production. → It Provides us a benchmark data for the new process setup. → Overall Equipment Effectiveness helps to track progress in eliminating waste from a manufacturing process.